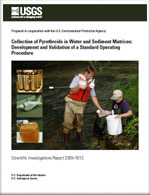 Collection of Pyrethroids in Water and Sediment Matrices: Development and Validation of a Standard Operating Procedure; 2009; SIR; 2009-5012; Hladik, Michelle L.; Orlando, James L.; Kuivila, Kathryn M.
Loss of pyrethroid insecticides onto surfaces during sample collection can confound the interpretation of analytical and toxicity test results. Sample collection devices, container materials, and water matrix composition have a significant influence on the association of pyrethroids to container walls, which can be as high as 50 percent. Any sample collection method involving transfer through multiple containers or pieces of equipment increases the potential for pyrethroid loss. This loose 'surface-association' with container walls can be reversed through agitation. When sampling water matrices with pumps or autosamplers, no pyrethroids were lost as long as the water was moving continuously through the system. When collecting water matrices in containers, the material with the least amount of pyrethroid sorption is as follows: glass less than (<) plastic less than (<) Teflon. Additionally, pyrethroids were easier to re-suspend from the glass container walls. Since the amount of surface-association is proportional to the ratio of volume-to-contact-area of the sample, taking larger-volume field samples (greater than 3 liters) reduced pyrethroid losses to less than 10 percent. The amount of surface-association cannot be predicted easily because of the dependence on water matrix composition; samples with higher dissolved organic carbon or suspended-sediment concentrations were observed to have lower percent loss. Sediment samples were not affected by glass-container sorption (the only containers tested). Standardized sample-collection protocols are critical to yield accurate pyrethroid concentrations for assessment of potential effects, and have been summarized in an accompanying standard operating procedure.